Korean (Asian) Ginseng seed, Panax ginseng. Panax Ginseng is the true ginseng of the orient. Adaptogen and yang tonic, which warms and strengthens the chi. Highly regarded. A plant of forested mountains and remote places. 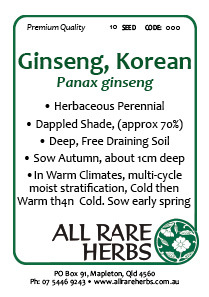 Panax Ginseng is native to Southern China and Korea and prefers a moist, well drained soil in a protected, part shaded position. Frost resistant but drought tender. An herbaceous perennial, growing to 0.3m x 0.2m. American Ginseng seed is also available. Be the first to review “Ginseng Korean, seed” Click here to cancel reply.